An epic tale of Christ and his world! 70 AD. After years of fierce struggle, the Roman army has recaptured the Holy Land from radical Judean insurgents. Only Jerusalem with its mighty temple is the last bastion of resistance against the Empire. The young priest Yosef has sided with Rome and is now desperately trying to negotiate an end to the bloodshed. But one night, a stranger appears: Shimon, an old man from Galilee. He claims to be a disciple of "Lord Yeshua"--the crucified magician whom some believe to be the Messiah.Yosef is captivated by what Shimon reveals. How, many years ago, he met the legendary preacher Yochanan the Baptist at the Jordan. How they stood up against prince Herod and the powerful temple elites. And how his life changed through that mysterious man from Nazareth, Yeshua... Does this story hold the key to saving the Jewish nation from doom? And will it save old Shimon from death on the cross? Take a deep dive into history and rediscover the true spirit of the Gospel. From the war-torn streets of Jerusalem to the wilderness of the Jordan river... The Reign of God takes you to a dangerous ancient land where priests, prophets, and kings struggle for divine authority. A land soaked in revolution, poetry and people&apos;s hunger for justice. This stunning vision of the Bible comes to life with detailed ink drawings and their expressive shadow and light. 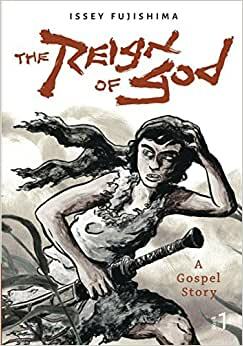 Loaded with a dense atmosphere, passionate characters and careful historical research, this graphic novel digs into faith questions that other "Bible comics" won&apos;t touch today. Japanese-German artist Issey Fujishima delivers an emotional drama--not with superheroes, but with a broken boy&apos;s search for family and healing. Until the last page, The Reign of God will inspire and challenge believers and non-believers alike. Start reading The Reign of God: A Gospel Story on your Kindle in under a minute.